I'm a little behind on my magazine reading. This is from the November issue of Country Living, which has an article featuring Maureen "Mo" Ecke's farmhouse. I just love the table with the scallop trim paired up with the industrial style chairs (from Sundance). Etsy seller UrbanAccentHome has some similar vintage chairs, along with several neat pieces of industrial style furniture. 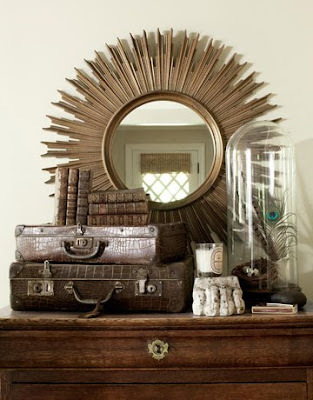 Also in the November issue of Country Living is an article featuring Caroline Scheeler's home. 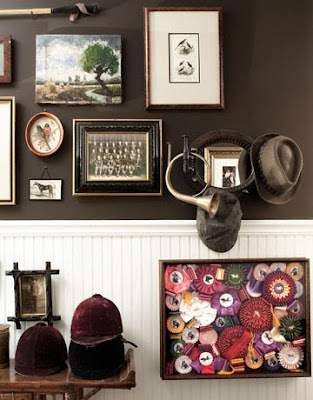 Just look at that shadowbox frame stuffed to the brim with vintage horse show medals. It provides such a wonderful and unexpected burst of color! From the same house, isn't this tabletop just perfect? Order your Purification Oil here!